Historiated initial H on a leaf from an illuminated Antiphonal. Text: Responsory, Matins, Christmas Day. Leaf: 510 x 335 mm, initial: 101 x 82 mm. 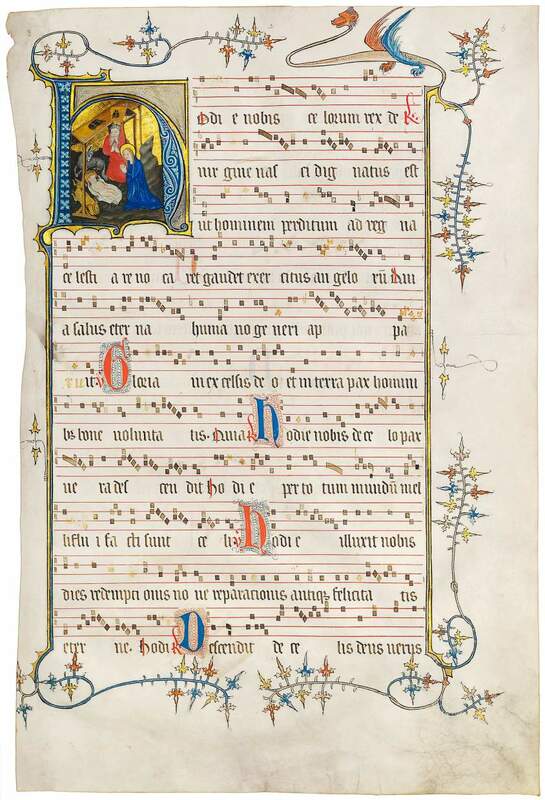 This initial opens the Responsory for Matins on Christmas Day. The Nativity is presented in a modest wooden shed where the Christ child and his parents are accompanied by a rather playful ox and donkey. Joseph kneeling in prayer is placed somewhat to the back, yet centrally. With long hairs and beard of an old man, his face is delicately drawn and shows the hand of an accomplished artist. The style of the decoration is attributed to Tournai (then France, today Belgium, Hainaut), a flourishing town between Ghent and Valenciennes. The borders and the bold initial with delicately tooled gold ground are paralleled in other manuscripts made in Tournai, c. 1385-1415. An origin in a French-speaking town is supported by the instructions to the illuminator in French as noted on sister-leaves.